Happiness is the view from my sewing room window. It's been raining since 4:00 yesterday afternoon and it is still an amazing view. Especially since spring is here and everything is turning green. The trees are budding and seeing the fenced-in garden reminds me that I can start thinking about planting vegetables. I've already planned out where things will be planted and I've made a list of seeds and plants I need to purchase. It's still a bit early to actually do the planting but it's fun to think about it. Even through the gloomy day, I love this view. Yesterday I cleaned my sewing room. I love how nice it looks once all my fabrics are organized and put away. All the notions are stashed away and there's no more piles of batting and other stuff laying about. It's like starting with a clean slate. I even took all my city blocks off my design board. The room even feels brighter. I thought I would take the opportunity to make a few more blocks for the my small world project. There are so many very small blocks in this quilt that I've decided to work on it a little at a time. The quilt has seven sections and I am still on section 1. I'm really not in a hurry to finish it, I want to enjoy the process and take my time. It sure is fun to mix new colors into the project. This will definitely be a long-term project. I'm thinking maybe I can complete it by the end of summer. That feels like a reasonable goal. For now, I will work on the pinwheel blocks. 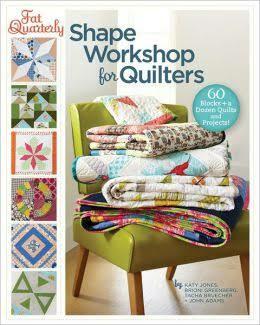 I need to make 3 4-inch pinwheel blocks and 16 2-inch blocks. I completed my version of block #46 for the City Sampler. This is the final block so I now have all 100 ready to go! It feels so good to accomplish this very unplanned project. I am finally at the finish line with my 100 city blocks project. I am proud to say that using the charm pack, layer cake and jelly roll that I won a few months back, I managed to get all the blocks made. That is all except one. That one block number 46 where I need 8 3-and-a-half inch squares - 4 from one fabric and 4 from a second fabric. The problem is that I only have pieces left 2-and-a-half inches wide or smaller. I really did not plan this out very well. Actually, I didn't plan it out at all. I just decided to wing it. So I think I did pretty well all things considered. But for this last block, block number 46 I was at a loss. My daughter stopped by to see my progress. I really think she wants this quilt when it's done. I had to remove blocks 1 through 40 from my design board. There's just not enough room to hold all 100 blocks on the board. So I could show here blocks 41 through 100. 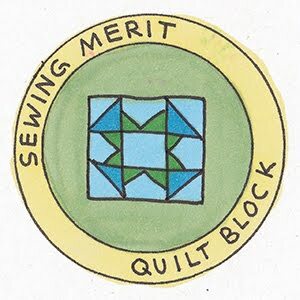 When I told her my dilemma with block number 46 she says, "why don't you just cut 2-and-a-half-inch squares since that's all you have then put a border around the whole thing"? That is just genius. I guess I never thought about deviating from the book. 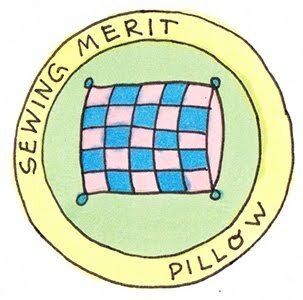 But I really think that would be better than purchasing two fat quarters just to complete this project. Especially since I have enough jelly roll sized pieces to make it work. Tomorrow I will get that last block completed so I can get to work planning on my layout. I also have to choose my background fabric. I'm not sure what color it will be, I just know it will be a solid. It's always fun choosing fabrics and I really look forward to it. So here are my blocks starting with block number 41 through block number 100 minus block 46! I asked my husband to whip me up some birdhouses. I wanted 5 of them to place on top of the arbor that is the entrance to my garden. I was surprised how quickly he came up with these. My only request was that they were not all the exact same size to give them some interest and to make grouping them together much more appealing. So I painted the birdhouses with some pretty colors. Now my granddaughters will want to embellish them with some cute designs on the paint. I was surprised how true to form the birdhouses were. They had no perches which helps keep predators out and the tall ones have false floors in them to make them more desirable to small birds. In fact the opening holes are cut just the right size for small birds. I can't wait until they are installed over the garden gate. They will look so cute there! We always get a real Christmas tree. We are lucky to know someone who owns their own Christmas tree farm and all we have to do is just ask for a tree. We tell them we want a Frasier Fir, preferably a skinny, shorter version. Like a Charlie Brown tree. Of course, it's never like that. The trees are always very beautiful and we are grateful that all the fuss of going out in the cold to personally pick out a tree is removed from the process. Some people enjoy that ritual but not me, I am really not fond of cold weather. So this works out perfectly. For me, the hard part about having a real tree is letting go. It seems such a shame to cut this beautiful living thing down for something so (realistically) unnecessary. But there is something to be said for the amazing pine smell that permeates the house. So I keep the tree up for as long as is practical. And once we take it down we place it in my garden for the duration of the winter where it becomes a refuge for the birds. It's amazing to see how many little birds protect themselves among the branches during bad weather. It's a beautiful thing. Once spring comes I have to get the tree out of the garden. So we have a bonfire to turn the tree into ash. The ash gets turned with the compost that goes back into the garden. It's a great way to complete the circle and use every bit of that tree. So another year goes by and we feel good about renewing nature's gift and giving it back to the earth. For my second attempt at cheese making I used a recipe called Super Easy Basket Cheese for Children. I had a spare gallon of raw milk that I had to use very soon before it expired. I could have froze the milk but I really didn't want the stress of knowing I had to eventually use up the frozen milk. I just wanted to use it while it was still fresh. I also kept the whey from my first batch of cheese. Some articles I read about cheese making stated that adding the whey made better cheese. So for this batch I used a gallon of raw milk and a quart of whey. My first cheese making experience made me much more confident for this time. I poured the milk and whey into the pot and turned on the heat. I also added a teaspoon of salt right off the bat. My first batch was not salty enough. I wanted to fix that. So as the milk cooked I prepared the bowl for the curds and got ready to scoop them out. 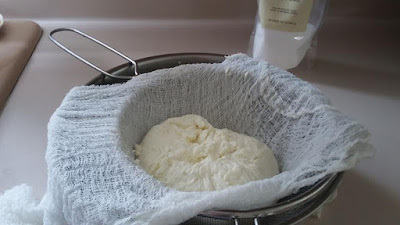 I got the baskets cleaned and ready - no cheesecloth this time! I have the real cheese making equipment! Once the milk reached 86 degrees I added the rennet, stirred and turned off the pot. I waited minutes to find perfect curds. I turned the pot back on while removing the curds from the whey. I filled the basket to the very top. I squeezed and squeezed until more whey came out. After a few hours, I removed the cheese from the basket and put it in the fridge. By dinner time the cheese was ready and we had it as an appetizer before dinner. It was squeaky like cheese curds when biting into it. It was fantastic. Much better than the first batch. I can't wait to try another recipe - it sure is fun to make this wonderful food from scratch. I've decided to work on the city sampler blocks today and I completed another 12 blocks. These are coming along pretty quickly considering I've set the project aside for a few weeks. Between Easter and some other commitments, there hasn't been enough sewing time. 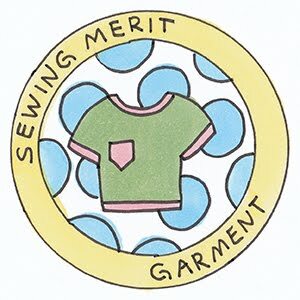 Happily, I have every Wednesday as a dedicated sew day. My friend, Sue comes over and we sew together all day. It's great to have the extra incentive from seeing someone else's creativity. It sure inspires my own. So today was a good day to complete more of the 100 blocks. I now have 57 completed and another 10 blocks cut and ready to sew. I don't think it will be long to the finish line now. I whipped up a few more mini zipper pouches this week. I had cut them out a few weeks ago but never did any actual sewing. So I thought this was a good time to get them out of the unfinished object (UFO) pile and into the finished pile. That always feels good. I made a few of these a while back and my granddaughters love using them for their little Shopkins and to hold their allowance. I think they might make a nice item at craft fairs. 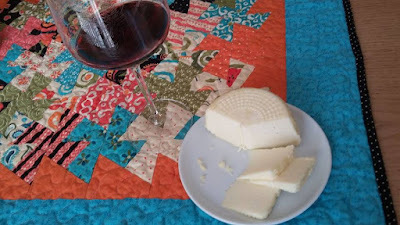 I've been dying to make some cheese ever since I took a cheese-making class a few years ago. I've always wanted to make raw milk cheese; it's said to be the best kind of cheese to make from scratch. The problem is that raw milk is not sold in my state and I just never took the time to go somewhere else and get it. But finally I acquired some raw milk this week. Since it isn't easy to come by around here I was very happy when I got 2 gallons of this wonderful stuff. As for recipes to make cheese, I can't remember where I put the ones I got when I took the class. And I wasn't that ambitious to look through all the files of recipes I've acquired over the years so I thought I would surf the net to find a recipe. 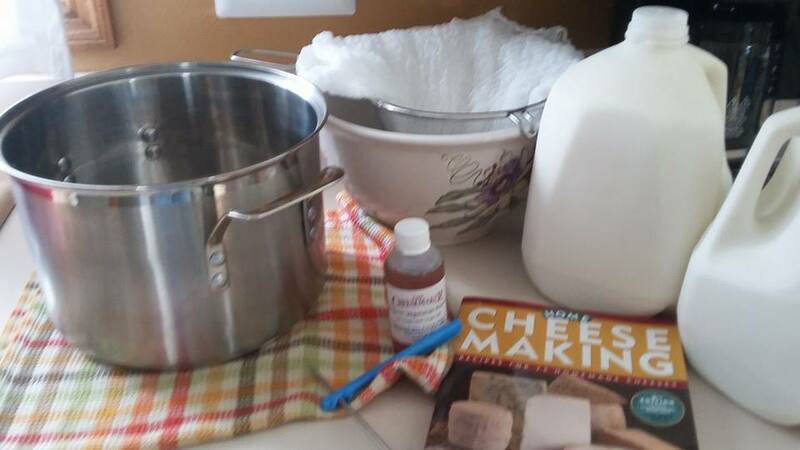 I remembered the basic steps in the cheese-making process so I knew what I was looking for. I found the perfect recipe here. I had all the ingredients and equipment necessary to make the cheese so I got to work on it this afternoon. I even came across a book on cheese-making in my library but the recipes in it were way more complicated than what I learned in the class so I think I will save the book for a time when I have more experience at this. I followed the recipe I found on the internet however, it says to add whey. I didn't have any because I haven't made any cheese as of yet. Since the whey was listed as optional, I just ignored it. I heated my milk with a low flame and waited for a while to check the temperature. As long as the outside of the kettle didn't feel warm, I figured I had time before testing it. The thermometer got to 86 degrees and I turned the stove off. I added the 13 drops of rennet and stirred it in. This is where I was unsure what to do next. The kettle has to sit for 45-60 minutes while the curds form, but it's supposed to stay between 80 and 90 degrees while it sits. I was worried that it might cool down too quickly so I turned the oven on in order to keep the stove warmer. After checking the temperature of the milk 3 times in 2o minutes I realized I was worrying for nothing. The kettle is such a nice thickness that it was holding the heat in nicely. It took over 60 minutes to get a clean break on the milk. The recipe I used had a link to the explanation of what a clean break is, but the link was broken. So I used this YouTube video to learn what a clean break is. I cut the curds into chunks then turned the stove back on to get the temperature back up to 100 degrees. Even at a low heat, it literally took less than 5 minutes to get up to 100. I placed the curds into a bowl and added the salt. The recipe called for 2 tablespoons of salt which made me nervous. I used one and a half tablespoons of salt. It was not enough. Follow the recipe! I ended up with a large bowl of whey. And once I strained the curds, there was more whey only this time it was full of salt. I ended up mixing the whey that had the salt in it with the whey that was plain. I'm not sure that's how it was supposed to be done...oh well. I stuck the whey back into the milk jug and put it in the fridge. I will use it in my next batch of cheese. I took my ball of cheese and pressed it between two plates with a heavy LeCreuset pot on top to weigh it down. I must say, this stuff does taste good. I can't wait to serve it on Easter Sunday and see what everyone else thinks. I took the pattern I used for my Star Wars Weekender Tote and took off 1-inch from each of the length and width of the bag. After making those adjustments, I thought I would make a sewing tote for myself. The weekender bag is pretty large and I thought that cutting it down would make a more manageable sized bag. The new tote is still pretty large, but it's just perfect for taking along projects and sewing notions to sew days. I can now get everything in one bag. 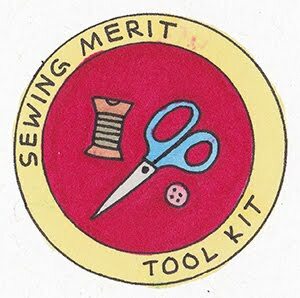 I used to have a separate tote for my sewing machine notions and accessories and another for unfinished projects. This is so much easier now that I can take everything in one. I love the purse zipper that closes nicely to keep from having everything fall out. I am pretty clutzy so I like the idea of the nice closure to keep it all together. I added an interior pocket to this tote and an exterior one as well. I took some of the coordinating fabrics and made a patchwork piece to make the pocket. This fabric is so cute that I plan on making some zipper pouches to match the tote. 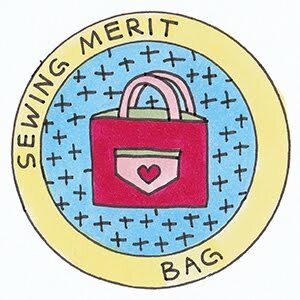 I can't wait to take this bag to my next sew date. I finished the binding on my chevron quilt this morning. I was hoping to finish it yesterday but I just wasn't in the mood to sit still. And hand-sewing binding requires a lot of sitting still. I used a gray solid for the binding on this quilt. It complements all prints found in the chevrons very nicely. This quilt is pretty big. It measures 60" x 72". I'm not so sure where this one will end up but I am pretty sure I can find a nice home for it. 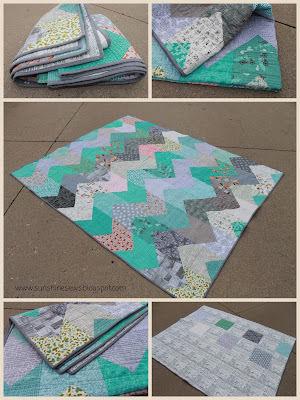 I finished the chevron quilt top from the pattern found in the book Quilts for Scrap Lovers. It's been sitting on my pile of finished quilt tops for quite some time. I finally decided to get to the quilting part and surprisingly, it didn't take me very long to complete the quilting. Maybe tomorrow after church I will be able to get the binding on. 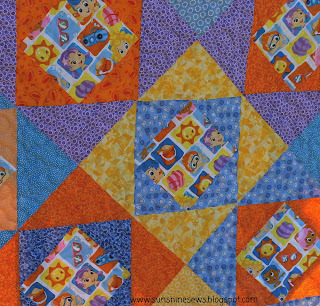 I used the economy block from the book, Shape Workshop for Quilters to make this Bubble Guppies-themed quilt for my granddaughter, Avery. Because of its smaller size, I think it will make a nice quilt to take on picnics and to the beach. The blocks finish at 12" so the quilt measures 48" x 48". I got the cute Bubble Guppies fabric earlier this year at a quilt show. I love picking up unique fabrics at the vendor markets at quilt shows. My granddaughter loves the Bubble Guppies cartoons. She watches them every morning while we wait for her older sister to head off to school so it has become part of our daily routine. So I just had to have this fabric when I saw it. I've changed up my section 1 pieces of my small world quilt. I still might change up the text block above the city building. I'm just not sure about that one. I'm also not sure about the barn block. I really like the reddish-brown piece but not so sure about the blue pieces. Up close the blue print fabric has some reddish-brown dots on it, so there is a bit of a match. Maybe after I make more of the blocks that go around that one, I might like it better. These pieces are so fun to make, but very time consuming. Plus there's a giant mess with all the scraps. I'm thinking this quilt project might be a reason to get my scraps in some kind of order. I love the challenge. I used a free online pattern and instructions to make these soup bowl cozies. They were a quick and easy project and I had so much fun making them. Originally, I was going to make two that matched and before I knew it, I had made four. They were so easy I think I will make some more and give them as gifts this year. Making these was a great way to use up my long strips of cotton batting left over from quilts. There always seems to be a strip of batting as long as a quilt but only 15 inches wide. It seems so wasteful to just toss it, so these soup bowl cozies fit those scraps perfectly. What a great way to use up some of those cute food-themed fat quarters I've purchased here and there. The tutorial I used can be found here. I finished by first block for the My Small World quilt. There are things I like about this block. I like the black and gray sections of the block and I like the sky sections. I also like the yellow windows. I think the variety of yellows makes it interesting. I don't like the two gray sections on the right side. I think the fabrics are too similar. And in one of the sections, the instructions were off so I adjusted some of the pieces which made the windows crooked. So I think I might take that section out and replace it with something else. That is the fun of this artsy project. I don't have a problem making second tries to make it look better. I decided that this will probably be my summer project so I don't mind how long it takes. I really want to get it right.